As React developers, we can't get enough of components! In general, the more things that we can componentize (or at least modularize), the better. A big issue with our React apps so far has been the styling. We have CSS floating around in external .css files that might be structured completely different from the components that use them. styled-components - the original styled components library and most widely-used. glamorous - by Paypal / Kent C. Dodds, also popular, inspired by styled-components, but with a different API. emotion - gaining popularity, inspired by the above two libraries, slightly different API again. Let's jump into an example and then we can explain what is going on. In an applied example, we can make a simple design using styled components. making components by referencing the styled wrappers for them. styled.div is a function that wraps around a React div element. The CSS is done in a string in normal kebab-case! You can see the slightly unusual syntax of the element (which is actually a function) followed immediately by backticks, e.g. If there is an expression preceding the template literal (tag here), this is called a "tagged template". In that case, the tag expression (usually a function) gets called with the processed template literal, which you can then manipulate before outputting. While we can utilize this syntax as part of the styled-components package's API without getting too deep into tagged templates, if you are curious how it all works you can read more on MDN here or check out this helpful article by Wes Bos. The great thing about styled components is that they can also accept props. Let's make another example using some props! We'll do a picture component called Pic that will either show up as a square or circle of custom size, depending on the props. and width are set to the same prop, 'size', which is a number. like your other normal React components! Pic is a composite of our box (styled div), wrapping an image. Atomic Design is one of the most popular web design patterns when working with component-based architecture. It's a great fit for organizing React applications! The above image is just a made-up example; real apps might be a lot worse! React projects without a predictable structure can be inefficient. Developers constantly have to search for the correct component code, and it does very little to foster a mental model of component hierarchy. Is HomeHeader a child of GlobalHeader or are they siblings where you use one of the other? What is the relationship between LoginForm and Form and FormContainer? While some of this can be chalked up to just naming things better, remember that developers often have trouble naming things, because it's hard! Luckily, while naming things is hard, categorizing things based on their relationship is much easier and will help us a lot. atoms - tiniest UI elements on a page, e.g. a button or an input. molecules - basic functionality of a few atoms combined together, e.g. a nav bar consists of several buttons. organisms - a functioning module of molecules and atoms, e.g. a full header would have navigation and a search bar. 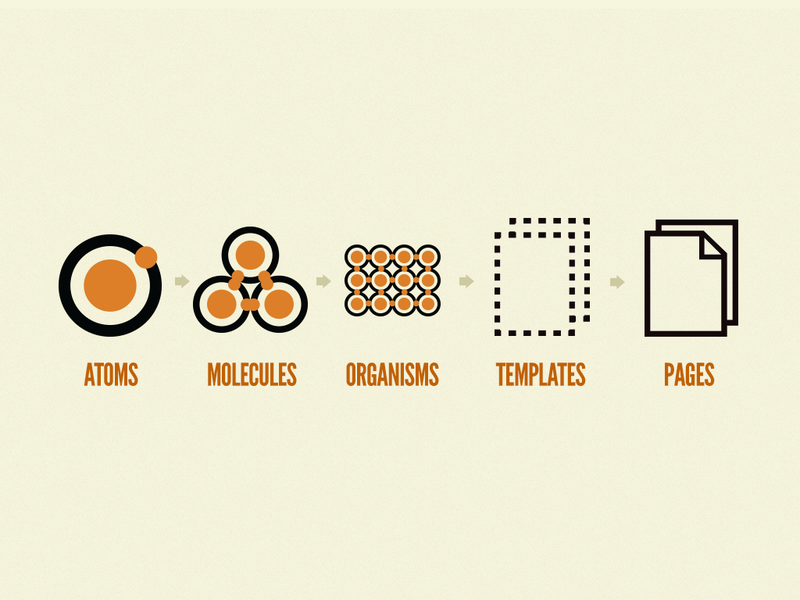 templates - a way of laying out organisms, molecules, and atoms on a page, e.g. a blog website might have a "base" template and a "blog" template. page - an specific instance of a template, e.g. the home page is an implemented base template. If you want to learn more from the originator of this idea, check out Brad Frost's website on atomic design! And maybe his book too. molecules: Rithm School header, repositories tabs, search bar, repository cards, top languages card, most used topics card, etc. atoms: heading + sub-heading text, nav items, images, breadcrumbs, icons. The exact classification of items is subjective, so this is just one possible interpreation of many. The point is that you agree with your designer / team about where to draw the lines between components, and that there is some show of logical hierarchy. atoms - styled components or simple wrappers around JSX elements. These should be "dumb components", i.e. purely visual with props and no state. Examples: a styled button, a styled input box, a card (styled div),etc. molecules - components that import several atoms to create slightly more complicated, but still "dumb" components. Examples: a navbar, a user card, etc. organisms - components that import atoms or molecules. This is generally where we can start to think of "smart" components, or components with state. It's easy to remember because organisms have brains! Examples: a form component, a filterable list, etc. Templates and pages are typically dumb components as well, just used as a layout for stateful components. However, because of downward data flow principles, you may want to make an API request on a page and pass it down to multiple organisms, etc.